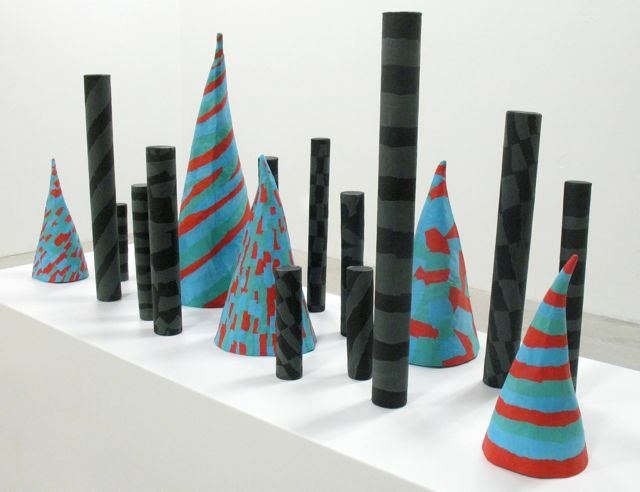 Jamie Q’s rods and cones at Art Metropole. Photo courtesy of Jamie Q. What to do today: Jamie Q sculpts, Kathy Krelove walks, Late Night in the Bedroom talks, and Felicity puts your grandma’s pies to shame. WALK: If you’re still working off your long weekend liquid carbs, skip the patio tonight and get those thighs moving at the High Park Nature Walk. Hosted by The Power Plant’s nature coordinator Kathy Krelove, the walk is specifically designed for science-staved urbanites to make a field trip from the core. Awaiting you is four hundred acres of wildlife, including birds, fish, mammals, amphibians, reptiles, and the occasional wayward llama. Meet at the High Park Nature Centre (430 Parkside Drive), 6–8 p.m., $4 members, $6 non-members (cash only). MUSIC: The rumours are true: Metric will be playing a short free show outside of Union Station tonight, for a Samsung Mobile product launch. You’ll want to show up early. Outside Union Station (65 Front Street West), 7 p.m., band on from ~7:10–8 p.m., FREE. ART: Alberta College of Art & Design–trained sculptor Jamie Q, long-time member of the Long Haul artists’ collective gone solo artist, presents Make-Believe—Jamie Q’s MFA thesis and first major solo show. For four days, it’s an artsy mish-mash of three discrete projects: found hexagon shapes as a large-scale molecule, paper-mache sculptures of the carnivalesque, and a silk-screened attempt at a Lotto 649 jackpot. Enter to win your own take-home Lotto print at tonight’s opening reception. It’s no million bucks, but still pretty good. Art Metropole (788 King Street West, second floor), 7–9 p.m., $2. WORDS/PARTY: It’s the season finale and one-year deflowering party for Late Night in the Bedroom, the online late-night talk show focusing on the arts community in Toronto. They’re taping live at Toronto Underground Cinema, the reigning venue of hiptitude and delicious popcorn, featuring interviews with street artist Dan Bergeron (a.k.a. fauxreel) and poster boy Jack Dylan, plus performances by Montreal metal band YAMANTAKA//SONIC TITAN and Toronto’s own folk-pop band Forest City Lovers. And if you need a little more convincing, one word: after party (alright, two words). Toronto Underground Cinema (186 Spadina Avenue), doors open at 7:30 p.m., $5. FILM: And because we can’t resist a lazy outdoor evening—there’s not too many left, folks—Free Flicks at Harbourfront is screening the delicious romcom Waitress. Keri Russell (though she likes to be called Felicity, and then reminded that she should never have cut her hair) is knocked up and unhappy, but baking pies makes it all better. Don’t question, just indulge. Harbourfront Centre at Sirius Stage (235 Queens Quay West), 9 p.m., FREE.